They say a picture paints a thousand words. So what better way to clarify your strategy concepts than to draw them out? Graphic recording augments the facilitation of your team’s creative discussions allowing ideas to form from words into images in real time. Working with your facilitator, a graphic recorder creates a group memory as your discussion unfold. Conversations are visually depicted to deepen understanding of new concepts and to visualize pathways that tell the story of how you plan to move from today to where you ultimately want to go. The graphic record is a true partner in the design, facilitation, and documentation of your planning meetings. The images drawn are digitalized and used as anchors in your session reports. Also, post-session graphic illustrations integrate your strategic thinking into a single image for enrolling stakeholders in your new direction. Graphic Recording is a visual tool we use to help our clients stay focused and on task during crucial conversations. This addition to our session facilitation encourages and stimulates the creative process so important to strategy development. 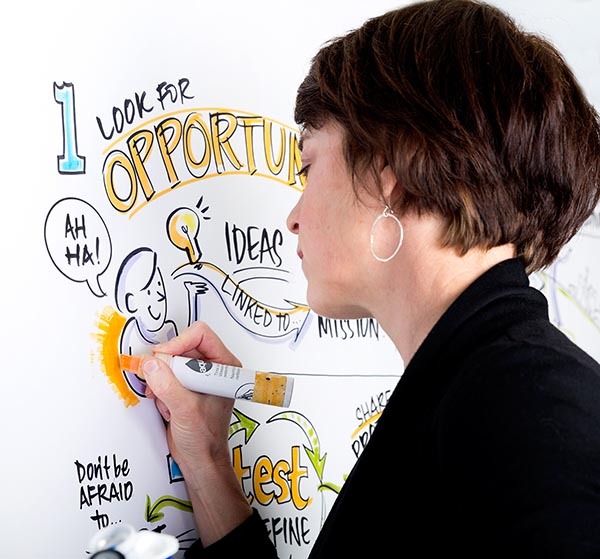 The graphic recorder (also called a graphic facilitator or a process artist), visually records the key discussions and presentations of a meeting as they happen. Using large format paper, he or she captures and synthesizes information in real time, to create a visual “map” of the meeting using words, images and icons. This highly visual format helps meeting participants understand the essence of their issues in a way that is impossible through a more linear process. A visual metaphor, diagram or image can reflect many levels of information that people can understand simultaneously. Seeing the “big picture” gives participants a shared understanding and allows them to quickly conceptualize complex information, see patterns and develop breakthrough thinking. Our charts are captured digitally and immediately available for sharing with other stakeholder or to continue your strategy development. Our strategy creation sessions are fully documented using these digital images so they are always available to refresh your experience with the Focused Momentum team.